Following the 2007 elections, as the North Rift region became engulfed in violence, some 10,000 people flocked to the Sacred Heart Cathedral in Eldoret. Bishop Korir made the cathedral’s grounds a sanctuary for displaced people, persuading those with guns to respect the sanctity of the Diocesan property and mobilizing the provision of aid to those camped there. One of our early initiatives was to hold peace seminars and trainings at hotels and our pastoral center, as an attempt to bring people to a neutral and convenient location. … However, we began to realize that the same people kept coming to all our seminars. … We were contributing to the creation of a class of ‘professional seminar goers’ …. We had unwisely and mistakenly relied on these people to carry the message of peace to the gun-wielders who caused violence…. But this was not effective…. We realized we needed to start again at the grassroots, to reach the actual perpetrators and victims of violence. 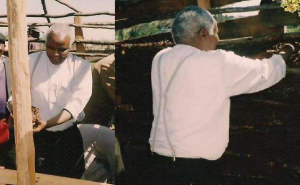 We needed to facilitate amani mashinani – peace in the village, not peace in urban hotels. Sustainable peace would have to be rooted in the local environment and engage those most affected by the violence, not just those who show up to NGO conferences. When Jesus disarmed the Apostle Peter in the Garden of Gethsemane, when he commanded that we love our neighbor as ourselves and turn the other cheek, he challenged us to build a new society rooted in respect and non-violence, rather than the maiming and killing of our rivals. But how do we do this in our context and our time? … [T]here is no panacea, no simple magic solution. … [I]t is not enough to talk to each other. Reconciliation cannot solely be on a personal, one-on-one basis. It requires a concerted effort to reorganize the political, economic, social (and too often religious) systems that produced the violent rupture in relations. … We must commit body, heart, mind and soul to work for justice and social transformation, working in solidarity with those working for structural change at the local, national and global levels. 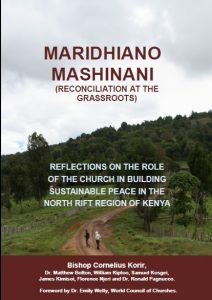 Maridhiano Mashinani is available as a free e-book here. 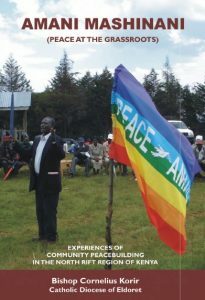 In Kenya, it is also available in a print version, published by Catholic University of East Africa Press.